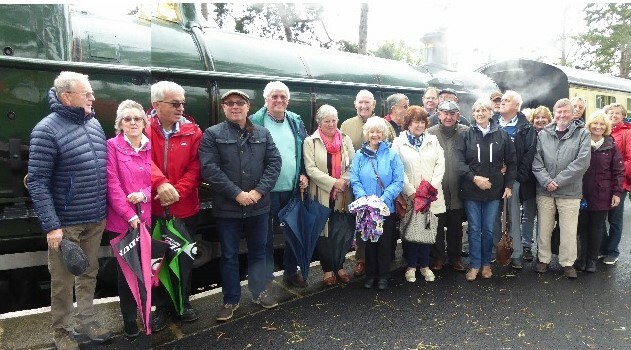 On Saturday 22 September 2018, a party of 20 brothers and wives set off from Cheltenham Racecourse station on the Gloucester & Warwickshire Steam Railway 10:55 to Broadway pulled by ex Great Western modified Hall Class locomotive “7903 Foremarke Hall” built at Swindon in 1949 for British Railways and retired by them in 1964, making it younger than some of its passengers! Two people only just made it before the train left having put the wrong post code in the sat nav! After a pleasant 1 hr journey we arrived in Broadway to find the light drizzle we left in Cheltenham had followed us along the line. After a brisk 20 min walk into the centre of Broadway, a picturesque Cotswold stone village, we arrived at the Horse & Hounds for lunch. A simple but excellent pub grub lunch was served – there was, however, one disgruntled diner who, after thinking that the helping of scampi was generous, was miffed to find only 10 pieces on the plate whilst others had 11 or even 12! A gentle walk back through the village to the station, punctuated by visits to some of the many interesting shops, ensued before boarding the 15:10 back to Cheltenham. Many thanks to Bro Jim Winterbottom for organising the day out which was enjoyed by all.